GDP values for the period from 2010 to 2014 compiled using 2002 and 2010 as base years are compared. July 09, 2015 (LBO) – Sri Lanka’s growth numbers in the last two years have been reduced with a new re-basing of national accounts estimates, Department of Census and Statistics said. Accordingly the growth rate for last year has been reduced from 7.4 percent to 4.5 percent and the growth in 2013 has been reduced from 7.2 percent to 3.4 percent. The main reason behind this reduction is the change of base year from 2002 to 2010. 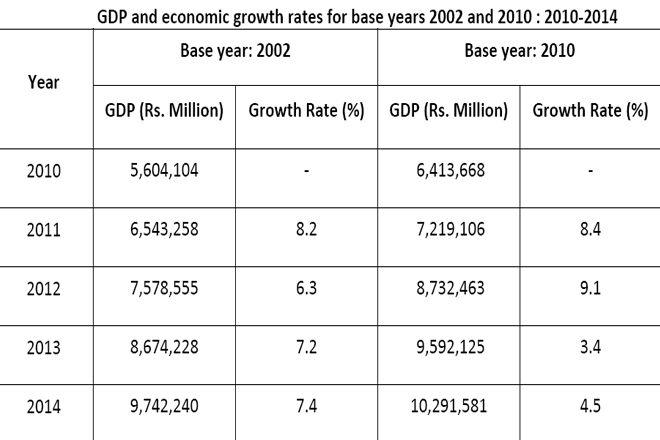 Until now, economic growth rate has been calculated using the year 2002 as the base year. Base year should be revised once in five years with the view of reflecting the changes in the economy. Accordingly the Department of Census and Statistics (DCS) decided to move the base year from 2002 to 2010. “While keeping the Central Bank of Sri Lanka and other relevant institutions informed, DCS has arranged to compute annually and quarterly National Accounts from 2010 to 2014 using production approach,” Department of Census and Statistics said. National Accounts will also be published until fourth quarter of 2015 with year 2002 as the base year. Under the new base year; 2010, national accounts will be published from the first quarter of 2010 onward annually and quarterly. “Estimates of a quarter will be published within 75 days after that quarter and these dates will be published through the data release calendar of DCS website.” Department of Census and Statistics further said.